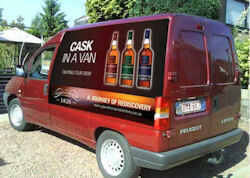 LAST year, GlenDronach malt whisky selected a single cask from its Aberdeenshire distillery...and took it round Belgium in the back of a van! The quirky tasting tour - called "Cask in a Van" - proved so successful that they're repeating it again this year. The Roadshow starts in Kampenhoudt on September 21 and ends in Zottegem on September 25. Regional Sales Director James Cowan said: "As our advertising slogan says, we're taking the brand "on a journey of re-discovery" around Belgium, one of our fastest-growing markets. "Following the phenomenal success of last year's tour, which was a huge hit with Belgian whisky fans, we're proud to announce details of our new 2010 tour. "Once again we'll be out in force with our special liveried van offering Belgians a unique chance to taste and purchase a truly excellent GlenDronach single cask whisky - this time it’s a 2002 release, which has been matured in a Bourbon barrel. In addition, we'll be offering tastings of our award-winning 12, 15 and 18 year-old core range. "Like last year, people will be given the opportunity to fill their own bottle of GlenDronach straight from the cask...charcoal, sheep's hair and all! As it's a limited edition, it's going to be a highly collectable item. "This is clearly an occasion not to be missed and is a highlight of our calendar of events in Belgium. "And in addition to the "Cask In A Van" whisky, we'll also be dropping a few GlenDronach crackers into the mix." GlenDronach's core range is available in over one hundred specialist stores throughout Belgium.